After a beautiful performance on Silk Way Rally, Thierry Magnaldi arrives to Egypt with his Polaris RZT 900 XT, prepared by EXTREME+, to test it in this magnificent desert. “I haven’t been to Egypt since 1999, and it has changed a lot! These last months, we have improved the RZR according to what we experienced during the Silk Way Rally. The air flow has been intensified in order to cool the fuel and the engine and a water radiator that has been integrated as the spark plugs in the rear part of the cockpit, with ventilation on the ceiling. Egypt is the best set to test the RZR Polaris before the Dakar; there is 90% of sand and 40 degrees each day… It will be, so, taken to a difficult but necessary test so we can make it more reliable before getting to the dunes of Fiambala and the Atacama Desert. We are also going to try out tires and confirm fuel consumption to establish a normal marge to calculate consumption by distance,” tells French driver. 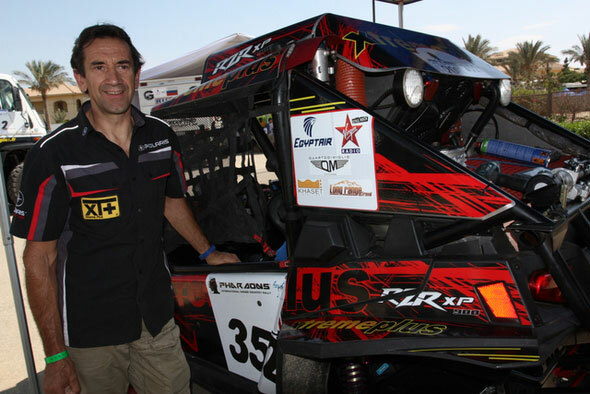 Tomorrow, Thierry Magnaldi and the RZR XTREME + number 352 will take the start for 2250 km of timed sections divided in six stages.